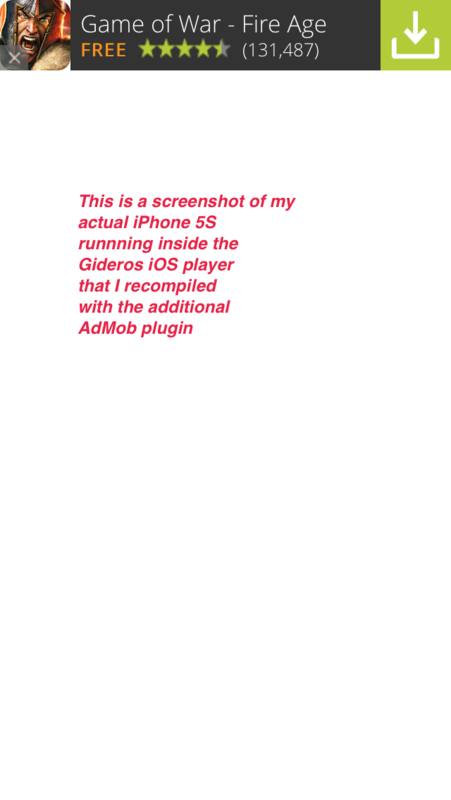 I'm trying to follow instructions for including AdMob ads in my project at http://docs.giderosmobile.com/interface/ads and am confused. 1. Why do we have to add the stuff to our exported Xcode project *before* we insert the lua code? If I have to add lua code, then don't I have to export my Lua project to Xcode *again*??? 2. Is my Lua code expected to run in Gideros Player after I add the ad stuff i.e. 3. The lua code require 'ads' gives an error when I try to run my project in Gideros Studio. Why? I'm assuming an "ads.lua" file must need to exist somewhere. Where do I get this file? Do I have to be a paid member? I assumed that since Gideros went Open Source, you didn't specifically have to (especially since I noticed my TestFlight app doesn't show the Gideros Splash Screen on startup on my iPhone). 5. I've tried to execute the example in the Ads plugin directory but I get the error at "require 'ads' " line. Is there a beginner's tutorial somewhere? I've read as much as I can on this forum but I seem to be missing something critical at the start. 1. You need to add the plugin to your exported project before you can add and test the Lua code. 2. You will need to build a custom Gideros player (with plugins) to test your Lua code. 3. The require "ads" is used to reference the plugin. It's not a Lua file. 3.5 The plugins are on Github. 4. I'm not sure about the procedure for XCode as I'm only using Android at the moment. 5. Refer to point 2 and 3 above. I didn't find a specific guide for ads. I had to look around a lot on the forum to get this working. It's worth it in the end though. Success. @ar2sawseen and @simwhi were both correct! 2. download Xcode (Version 6.1.1) from apple App Store for mac. Make sure your Provisioning profiles/etc... is all set up. 9. Right click on my project name -> Add Files to GiderosIOSPlayer -> then browse to the Xcode project -> Ads folder you copied in #6. make sure "Create groups" is selected. Then hit "Add". 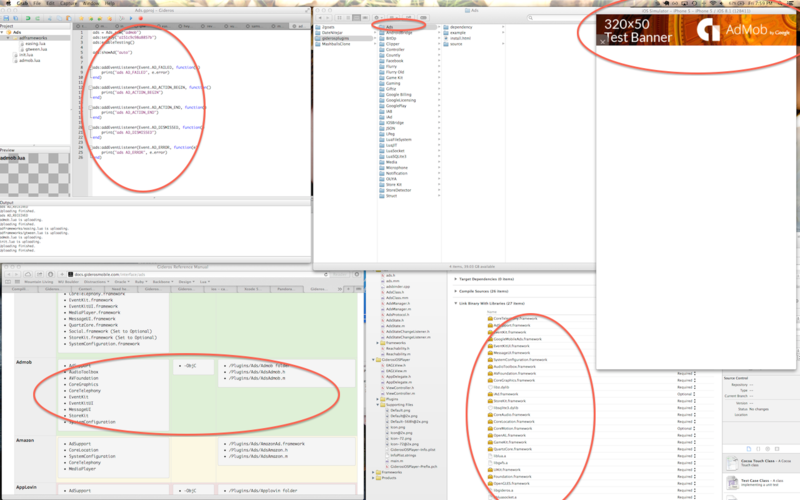 Notice a new "Ads" folder in your Xcode project. 11. Go to "Build Settings" -> Search bar -> type "Modules". in "Apple LLVM 6.0 - Language -Modules" settings ensure "Enable Modules (C and Objective-C)" says "Yes"
12. Select a suitable iOS SImulator and click PLAY. It should build and run. Leave the simulator running. 14. In Gideros Studio click Player -> tick "Localhost" -> OK. Then click PLAY. You should see a "Test Banner" banner ad at the top of the Xcode/iOS simulator (DO NOT TRY/you CANNOT USE the Mac's Gideros Player -- your iOS Simulator is at "localhost"). 15. Close the iOS Simulator (hit STOP). 16. Then connect your iPhone to your Mac. Then Select your iPhone in the Xcode Menu and hit PLAY to install the new Gideros Player on your iPhone. 18. In Gideros Studio, hit Player -> add the IP of your iPhone. on your iPhone, start the patched GiderosiOS Player. Wait a second. Hit PLAY in your Gideros Studio. A real banner ad should show up at the top of your screen in your patched Gideros IosPlayer! 19. Have a glass of wine! @velobuff Well done!! I'll follow your instructions when we start testing our game on iOS. errors of missing files. Am I using wrong versions?